BANGI, 23 May 2014 – The demand for information technology specialists must be met by 2020 if not sooner to deal with the sudden increase in stored data in organisations and institutions such as The National University of Malaysia (UKM) which requires hard disc space increase by a whopping 15,000%. Professor Abdul Razak Hamdan from the Faculty of Information Science and Technology (FTSM) said by 2020 UKM is expected to require storage space of at least 35 Zettabytes, or 35 billion terabytes to store data and run applications for e-services. In presenting his inaugural lecture here today on Digital Treasures: Competitive Intelligence, Intelligent Harvest, Prof Abdul Razak feared that information – which he regarded as a treasure – would simply disappear if not saved now. The digital data is necessary for use to assist decision making. Data storage in the “cloud” alone is not enough, he said. UKM and other institutions must meet the urgent need for management and operation of digital data storage by creating a new position such as Data Scientist in line with the critical tasks to save the information. Prof Abdul Razak described the responsibilities of information systems managers as becoming too heavy, as witnessed in UKM because of increased demand for new services. It’s not just information for employees to clock in or out or others such as espel but much more. Increased applications to attract consumers to input information has resulted in digital data becoming too large. In the future, online university system services will increase to store data such as academic staff performance measurement, performance analysis, deviation detection and human talent. For example, a model of human talent is the management of data to measure talent in terms of the criteria for a suitable staffing. He proposed three types of digital treasures harvested in various ways to build relevant models subsequently used for decision making. The first model is to harvest digital data information technology for strategic planning. The second digital treasure is to harvest financial reports of a bank that in turn is used as a model to detect deviation performance of the bank in terms of profits and losses. The third digital treasure will harvest human resources database which in turn is used to develop a forecasting model to predict the potential talent of the staff, especially academics. 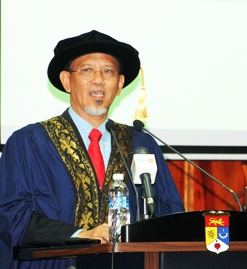 Also present at the inaugural lecture were Vice-Chancellor Prof Datuk Dr Noor Azlan Ghazali, who delivered the introductory remarks about Prof Abdul Razak and FTSM Dean Prof Dr Abdullah Mohd Zin and Deputy Dean Prof Dr Azuraliza Abu Bakar.